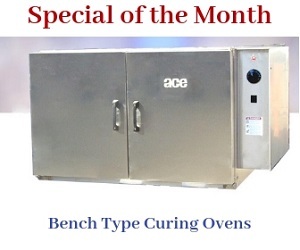 The ACE Model 330 RT burn off oven is a user-friendly pyrolysis system. It is designed to remove additives and other contaminants from metal components. This radiant tube oven model comes standard with the One Touch Control (OTC) and the automatic shut-off system. This means that the user simply needs to fill in the specifications, push the button, and the oven will take care of the rest. Customers can understand more about the oven by perusing the technical specifications given in the tables below. Volume Over Cart 26 CU. FT.
1 Top Mounted Pressure Relief Hatch 3.06 SQ. FT.
Natural Gas Inlet Pressure 8ʺ to 14ʺ W.C.
4 Propane Inlet Pressure 12ʺ to 18ʺ W.C. The design of the oven ensures that the heat treatment does not affect a component’s mechanical process in any way. The oven monitors the development of any harmful gases, and eliminates them with the help of the primary afterburner.